The capybara (Hydrochaeris hydrochaeris) is a semiaquatic animal resembling a giant guinea pig. It is found in Panama, east of the Canal Zone, and on the eastern side of the Andes Mountains in South America, the species ranging from Colombia and the Guianas to Uruguay and northeastern Argentina. It is the only living member of the family Hydrochaeridae, in the order Rodentia, class Mammalia. 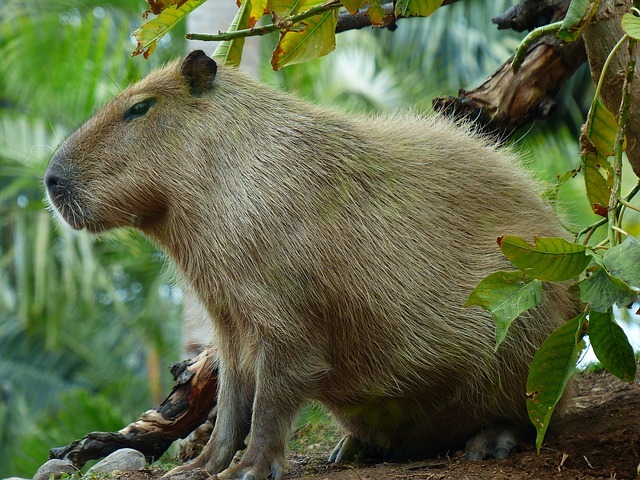 The biggest density of capybaras can be found in Brazil and along the rivers and marshes of Los Llanos in Venezuela. 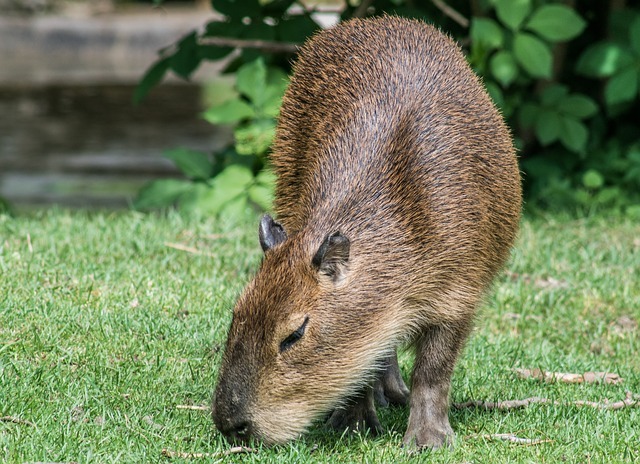 The capybara weighs between 59.5 and 174 pounds (27 to 79 kg) and has a combined head-and-body length of 40 to 50 inches (100 to 130 cm), a shoulder height of 20 inches (50 cm), and a vestigial tail. Species members have a broad, deep muzzle; short ears and tail; small eyes set far back on the head; and short limbs with partially webbed feet, the forefoot having four digits and the hind foot having three. Because the capybara has a rather sparse coat, its skin is visible beneath the long, coarse hairs. The fur is reddish brown to grayish above and yellowish brown below. It is worth noted that unlike other rodents, they have only one color. The capybara lives in densely vegetated areas around ponds, lakes, rivers, marshes, and swamps. Species members breed throughout the year, but mating seems to peak just before the rainy season, the time of which varies between regions. Gestation reportedly can last either 149 or 156 days. There is usually only one litter each year, with, typically, four young to a litter, although one subspecies, H. hydrochaeris isthmius, apparently gives birth to an average of five young after a gestation period of 104 to 111 days. 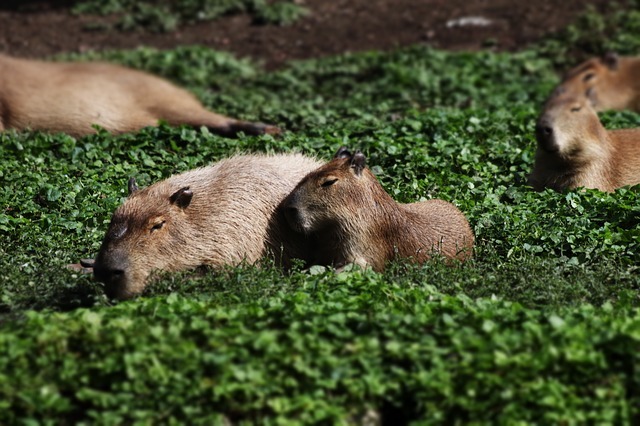 Because capybaras have no nests, birth can occur anywhere within their habitat. Newborns weigh about 3.3 pounds (1.5 kg). Lactation lasts 16 weeks, although even during this time grass makes up a major portion of the offspring’s diet. Both females and males reach sexual maturity at 15 months of age. Longevity in the wild is probably 8 to 10 years, but some animals in captivity have lived to over 14 years of age. 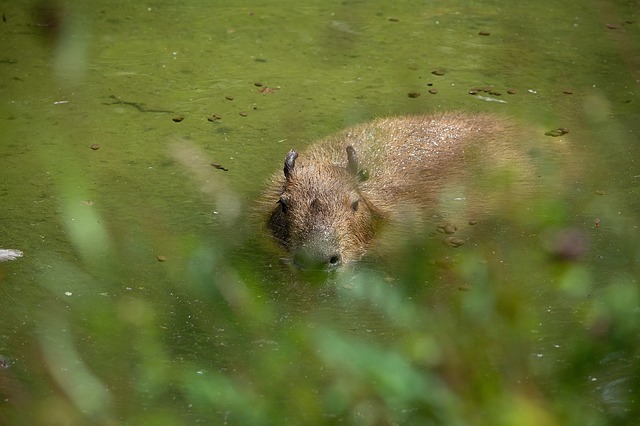 The capybara is active in the morning and evening, wallowing in mudholes and shallow water during the hottest part of the day. In areas where it is frequently bothered by humans, however, the animal has become nocturnal. When closely pursued, H. hydrochaeris enters the water, where it may swim to safety, with only its nostrils, eyes, and ears exposed, or it may hide in floating vegetation, with only its nostrils exposed. The capybara can also swim totally submerged for long distances. Species members are normally found in herds containing 20 individuals, although smaller groupings, comprising only family members, are also seen. A typical group is headed by a dominant male and possesses a hierarchy established and maintained by aggression and fighting. In addition to grasses, the species also feeds on aquatic plants as well as grains, melons, and squashes. The capybara has been hunted as an agricultural pest and for its valued meat and fur. Consequently, Venezuelan and Peruvian populations have shrunk, although the animal is still common throughout much of South America and currently hunting them is either regulated or prohibited.